Due to the anxiety or embarrassment it can cause, halitosis – or bad breath – can be difficult for many people to face. 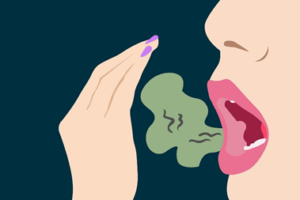 However, clean-smelling breath may be easier than you think. Try these solutions to overcome halitosis and regain your confidence. Maintain oral care – Brushing and flossing your teeth is incredibly important to warding off bad breath. Make sure to brush at least twice a day and floss once a day. Quit smoking – Cigarettes and other tobacco products are a common cause of halitosis, in addition to more serious concerns like oral cancer or gum disease. Chew sugar free gum – Carry a pack of sugar free gum to chew between meals. It can stimulate saliva flow, mask odors, and prevent tooth decay that might indirectly cause bad breath. Avoid gum that isn’t sugar free, as this can introduce more sugar to your teeth that might contribute to decay. Mouthwash – While it is only a temporary solution mouthwash can be a quick way to provide relief from halitosis. However, if you feel you need to use mouthwash several times each day, contact our office for an exam to check for the underlying cause of your bad breath. Clean your tongue – When brushing your teeth, make sure not to ignore your tongue. Brush it gently with a wet toothbrush or use a tongue scraper with care. This helps remove bacteria and food particles that can collect on your tongue and cause bad breath. Dental visits – Tooth decay, gum disease, and many other dental health issues can be the source of halitosis. By maintaining your recommended schedule of cleanings and examinations, we can work with you to treat any underlying causes of bad breath and ensure your optimal oral health. Halitosis can be prevented by targeting underlying concerns such as tooth decay. Schedule a visit with our office for a cleaning and an examination and enjoy the clean taste of fresh breath. 92117 Dentist | Are You Using the Right Mouthwash?